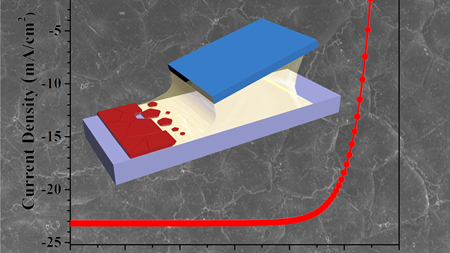 Meniscus-assisted technique could lead to high efficiency perovskite films. A little fluorine can turn two-dimensional hexagonal boron nitride from an insulator to a semiconductor with magnetic properties. Smoother surfaces on a solid electrolyte could eliminate or greatly reduce the problem of dendrite formation in lithium-ion batteries. Submissions are being accepted for the 2018 OWSD-Elsevier Foundation Awards for Early-Career Researchers in Developing Countries. Scientists have created the first machine learning method for predicting the properties of new metals, ceramics and other crystalline materials. Find out who will receive one of the 2016 Acta student awards. A new ‘controlled spalling’ layer transfer technique can derive thin films from superconducting gallium nitride crystals. By depositing bismuth onto a silicon carbide substrate, scientists have created a topological insulator that can work at room temperatures. New electrode designs based on a highly conductive, two-dimensional transition metal carbide could produce fast-charging batteries. A new low-temperature solution printing technique can fabricate high-efficiency perovskite solar cells with large crystals. Scientists have found evidence for a new type of electron pairing that may broaden the search for new high-temperature superconductors. A combination of experimental and theoretical methods has revealed evidence of superconductivity on ultrathin lithium titanate films. Scientists have produced the most detailed study yet of the thermal effects of semiconducting metal-nitride nanowires. Carbon nanofiber electrodes coated with a conductive polymer and bacteria can generate electricity while cleaning wastewater. A new strong, thermally-stable nickel-containing alloy could prove an ideal replacement for silicon in microelectromechanical systems. Halide perovskite semiconductors can emit multiple, bright colors from a single nanowire at resolutions as small as 500nm. Scientists have created a novel 2D material in which electrons travel in one direction with one type of spin, which could be useful for spintronics. An inexpensive material called quinone makes an effective anode for safe, long-lasting batteries that work across a range of temperatures. Scientists have found that amorphous regions of a polymer film can transport ions, while crystalline regions are better at conducting electrons. Scientists have made theoretically-predicted heterostructural alloys, blends of compounds that don't share the same atomic arrangement. A novel nickel oxide compound is an unconventional but promising candidate material for high-temperature superconductivity. A new semiconductor alloy that can capture near-infrared light could improve the efficiency and reduce the cost of concentrator photovoltaics. A novel chemical process can deposit nanomaterials on graphene without changing the properties and arrangement of its carbon atoms. A new way to create extremely thin electrically conducting sheets within crystals could lead to reconfigurable electronic circuits. Tracking and controlling dynamic molecular vibrations.